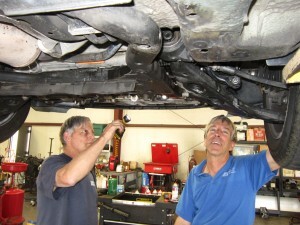 Looking for the best Auto Repair shop with the most experienced staff in Prescott? Look no further. Biel Foreign & Domestic Repair & Service has been serving the area for almost 35 years and can take care of any problem no matter the make, model or year! Up here in Central Arizona, we experience all 4 seasons and so do our automobiles. Routine maintenance is key to make sure your car runs smoothly no matter what the conditions are, it also helps you avoid any major repairs that can be costly. Our shop not only aims to be your dealer alternative for factory scheduled maintenance (we charge a lot less) but also your one stop shop for all repair oriented needs. Our owner and head tech, Rich Biel started working on Volkswagens back in 1974 as a teen then on to a dealership in Philadelphia till he moved out here. He worked at a small Volkswagen shop here in Prescott and opened his own place in 1982. Rich has been fixing cars and trucks ever since. What started as a foreign repair specialty shop has now grown into a full service center over the last 30 years plus!! Our specialty includes all brands whether car, truck or Fleet service. So if you’re new to the area or have been here longer than we’ve been, come on in today or give us a call to make an appointment! If you’re average time in your automobile is short, your car may not have the proper amount of time to warm up completely. The period from when your car’s engine is started and trying to completely warm up is the hardest time which makes having proper lubrication even more important. If you’re planning to go on a longer trip, make sure to get your oil checked before hand. You may not need an oil change but your mechanic will be able to let you know if your oil is low. This could be a sign of another problem. Your technician may recommend to be wise and get it replaced so your engine can run at its peak efficiency. They can also check for problems that might arise on your voyage as well. If you’re a more aggressive driver or plan on working your car hard your oil will need changing more often. Again this helps prevent wear which will help keep your car running better longer. Remember that even if you don’t drive your vehicle very much, your oil can still become contaminated. This contributes to accelerated engine wear and can cause long-term damage, so if you don’t drive 3,000+ miles in under 3 months you may still want to get your oil changed.Remember, maintenance ALWAYS costs LESS than reapirs. Some warranties may be dependent on regular maintenance like oil changes. If you fail to get your oil changed at the suggested periods and it leads to an issue with your cars engine your warranty may not cover you! Come by our shop or call us to make an appointment today and have Rich and his mechanics take a look.